Isedo Therapy facilitates healing through directed use of pressure point stimulation and talk therapy combining elements of Reiki, Qi Gong and regression therapy. 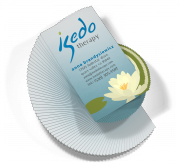 Isedo provides individual therapy sessions, group workshops and retreats at it's locations in San Francisco and Grass Valley California. Isedo Therapy is a guided exploration of past experiences, present beliefs, and future transformations. Scanning the energy vibrations throughout the body reveals areas of congestion created by beliefs based on past experiences. A combination of Acupressure massage and Energy Channeling encourages memories of events to surface. Present stagnant beliefs created from the memories are identified and explored. The greater understanding of past experiences combined with the energy channeling unlocks the potential for transformation of these beliefs. The transformation releases the flow of energy, which in turn, can heal both physically and spiritually. A collection of flyers used to advertise a series of "Spectrum of Consciousness" events held by Isedo Therapy that teach a method of personal awareness and goal oriented improvement.